Some oppressed groups fought with guns, some fought in court, some exercised civil disobedience; the Melungeons, however, fought by telling folktales. 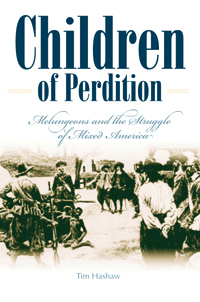 Whites and blacks gave the name "children of perdition" to mixed Americans during the 300 years that marriage between whites and nonwhites was outlawed. Mixed communities ranked socially below communities of freed slaves although they had lighter skin. To escape persecution caused by the stigma of having African blood, these groups invented fantastic stories of their origins, known generally as "lost colony" legends. From the founding of America, through the American Revolution, the Civil War and World War II, the author documents the histories of several related mixed communities that began in Virginia in 1619 and still exist today, and shows how they responded to racism over four centuries. Conflicts led to imprisonment, whippings, slavery, lynching, gun battles, forced sterilization, and exile—but they survived. America's view of mixing became increasingly intolerant and led to a twentieth-century scheme to forcibly exile U.S. citizens, with as little as ?one drop? of black blood, to Africa even though their ancestors arrived before the Mayflower. Evidence documents the collaboration between American race purists and leading Nazi Germans who perpetrated the Holocaust. The author examines theories of ethnic purity and ethnic superiority, and reveals how mixed people responded to "pure race" myths with origin myths of their own as Nazi sympa-thizers in state and federal government segregated mixed Americans, citing the myth of Aryan supremacy. Finally, Children of Perdition explains why many Americans view mixing as unnatural and shows how mixed people continue to confront the Jim Crow "one drop" standard today.